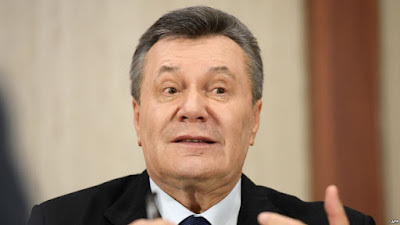 ‎LUXEMBOURG CITY, ‎Luxembourg -- The European Court of Justice (ECJ) has upheld sanctions imposed by the European Union on former Ukrainian President Viktor Yanukovych and his son Oleksandr. Former Ukrainian President Viktor Yanukovych fled to Russia in February 2014. The Luxembourg-based court confirmed on October 19 the freezing of their funds for the period from March 2015 until March 2016, upholding a previous ruling by the General Court. In a statement, the ECJ said that Viktor and Oleksandr Yanukovych had challenged the EU sanctions that were imposed on the grounds that they were the subject of pretrial investigations in Ukraine for offenses linked to the misappropriation of public funds. But the court said that the Yanukovychs' concerns over the impartiality of the Ukrainian judicial system "are not capable of calling into question the cogency of the charges made against them... or of demonstrating that their particular situation had been affected by the problems in the Ukrainian judicial system." Moscow-friendly Yanukovych was ousted by mass protests in Kiev in February 2014 and fled to Russia. The European Council decided in March 2014 to freeze the funds and economic resources of people who "were responsible for the misappropriation of Ukrainian state funds or for abuse of office causing a loss to Ukrainian public funds." The measure was subsequently extended every year. The sanctions target 15 people, including former Prime Ministers Mykola Azarov and Serhiy Arbuzov and the head of Yanukovych's presidential administration, Andriy Klyuyev. Yanukovych has denied misappropriating Ukraine's public funds.